The Jovian Faction Starter Force includes: 1x Jovian Wars Acrylic Turning Template $3.99 USD, 1x Valiant Strike Cruiser Remastered $16.99 USD, 1x Alexander Destroyer $16.99 USD, and 1x Ypres Battleship $19.99 USD ships. Plus the 7 Exo-Armor (Pathfinder, Hector, Retaliator, Vindicator, Pathfinder Recon, Pathfinder Sniper, and Stormrider) and 2 Fighter (Lancer Fighter and Lancer Bomber) Squads $49.99 USD. 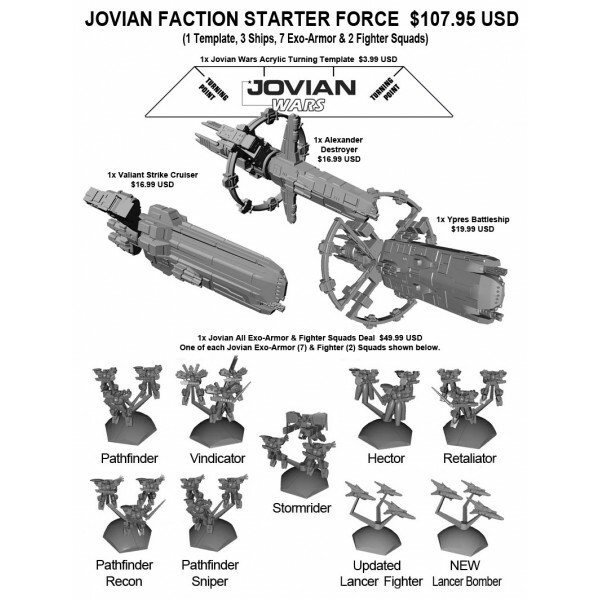 Total cost of the Jovian Faction Starter Force is $107.95 USD.